Summary: Elizabeth Holmes, the young founder of the company Theranos and a Stanford dropout, captivated everyone by promising a revolution in healthcare technology. Theranos claimed that its small device could run hundreds of tests using just one drop of blood. Rich and famous people bought the pitch from Holmes, a charismatic blonde with a startling deep voice. She was anointed the valley's shiniest new celebrity and being compared to Apple's Steve Jobs, an image she cultivated. Theranos, majority owned by Holmes, was valued in the billions. The problem was: the device never worked. Not even close. After Carreyrou's reporting revealed the truth, Holmes fell from grace. She has a negative net worth now, has been severely disciplined by the SEC, and is currently being prosecuted by the Department of Justice. Theranos, as a company, is in the past tense. One of the most exciting movies I have seen is Too Big to Fail, a story about the financial crisis that led to the Great Recession of 2008. The movie transforms a dry, arcane subject into a thriller as if the world were facing a nuclear holocaust. Bad Blood narrates with a similar relentless urgency. Despite factual constraints, the book reads like a thriller. As Carreyrou portrays her, Holmes was not evil, though her sins are quite unforgivable. Every startup puffs itself up, except in this case the lies hurt people. If you deliver false results from blood tests, people can die. In the end, Theranos had to throw out two years of test results from its device. Two years. That's tens of thousands of tests on which people relied for medical decisions. No one will dispute that Holmes was extraordinarily ambitious and hard-working, but similar to many go-getters, she was ethically ruthless. Most likely, Holmes did not set out to defraud, her proclamations to do great good sincere. She hoped that people who were squeamish of blood draws, like herself, would no longer fear the procedure. Patients might even do the draws at home and zap the data to Theranos for analysis. The disruptive technology would reshape the healthcare landscape and bring us closer to a Jetsonian world. The masses would rejoice, and angels would sing. In reality, it quickly became clear that the Theranos device, with its repeated failures, could not deliver the futuristic vision. Still, ethics never held back Holmes. As people told the queen she had no clothes, she always insisted that she wore the most extraordinary gown. Theranos squeezed out employees who questioned its practices, leaving the company with yes-people incapable of keeping Holmes honest. The ones who stood up to her were bullied into silence. 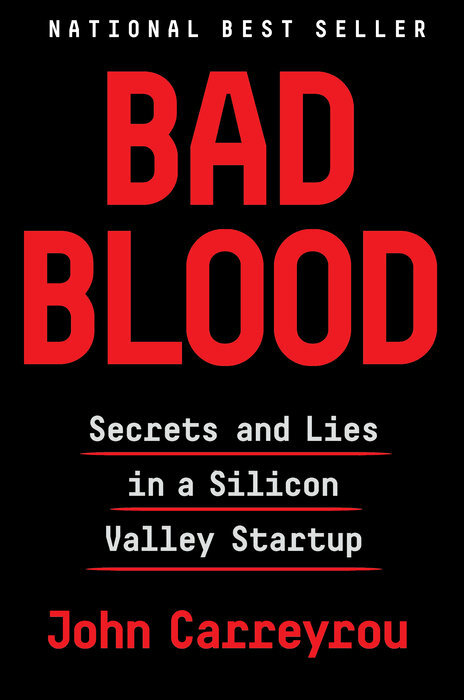 Threats of lawsuits backed by Theranos's massive warchest and led by David Boies, one of the country's most illustrious lawyers, intimidated potential whistleblowers. The saddest story probably belonged to Ian Gibbons, Theranos's chief scientist. He challenged her and as a result suffered an even worse fate. Amidst the chaos, many of Theranos's early, big-name supporters stuck with the company. Their loyalty, though foolish in hindsight, is somewhat understandable. They were charmed by Holmes and caught up in the frenzy. In the famous words of The X-Files, they wanted to believe. As Carreyrou points out, investor greed makes people fearful of missing out on The Next Big Thing. How did Holmes ever believe that she could get away with massive fraud? Blood tests are, after all, science. Results are verifiable. It's not like selling a perfume and claiming it'll make you sexier. Perhaps Holmes was blinded by her own self-grandeur. At what point does one cross from confident to delusional? Maybe once Holmes became massively invested in her promises, her ego rejected inconvenient facts. We see what we want to see. It's possible that Holmes was too hopeful: if she could buy enough time and throw sufficient money and effort at the problems, she could make the device work before everything blew up. It would be helpful to hear her side of the story, but (understandably) she did not cooperate with the author for the book. Right or not, result is what matters in history. Unethical, even immoral, acts are minimized when great benefits result. Perhaps Theranos's frauds would not have mattered if, in the end, its technology worked. But it never had that potential. Scientifically, Holmes's pitch was simply wishful thinking. I think two things help explain how the fraud got quite so far--first, Holmes comes from a Silicon Valley family and so was already familiar with the language of startups, so she was able to talk to powerful/important people in a language that they believed only successful entrepreneurs could speak. This deceived them, and once they were deceived, she believed it, too. Second, Holmes believed (not completely unreasonably) that all she had to do was get enough money and she could develop the technology. She had to pretend the technology already existed to get the money, but how could the technology exist without the funding to develop it? So lie, get the money, then develop the technology--lots of companies that actually succeed probably get started in a similar way. The only problem was that Holme's product couldn't be developed. Physics. She was running up against the rules of physics and the sheer quantity of blood needed for the tests she was trying to do. Holmes, being a neophyte who didn't actually know anything about blood testing didn't know this. Eventually, of course, she realized--maybe she knew from the beginning that she was taking a big risk but just squashed that voice of conscience--but by that time she was in so deep that it seemed impossible to get out. She had to keep digging and just hope that *something* would work out. But it didn't. This is, of course, a generous view. Nice review, btw. Sounds like a very interesting book. 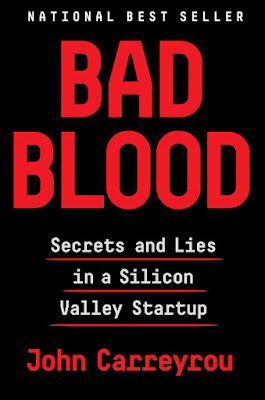 Thanks for pointing out the fundamental flaw with the Theranos device: it was trying to do too much with too little blood. That fact is emphasized in the book, and I should've noted it in my review because it's such a salient point. Maybe I'll go back and clarify my post. I suppose what Holmes should have done was to develop a prototype, patent it, then seek funding to refine the engineering and mass-manufacture. But as you point out, she didn't possess the knowledge to design the device and it's too hard to develop such a complex technology without big funding. Realistically, perhaps only big companies have the resources to invest in such innovation. Perhaps one day we'll be able to develop the technology to run a multitude of tests on a single drop of blood, but that seems a long way off. I was just thinking about this again after reading a description of this un-potty trained husky she kept in the complex and claimed was a wolf, and the amount of money she spent on the office complex herself, and had an idea I'd like your opinion on--what if Holmes had Jerusalem Syndrome, only she lived in Silicon Valley, so it manifested as Silicon Valley Syndrome? In Jerusalem Syndrome, slightly unstable visitors to Jerusalem become convinced that they're Jesus and have to spend a couple of weeks in an Israeli asylum until they remember that they're really Bob from Missouri. Well, Holmes lived in Silicon Valley, so she became convinced that she was Steve Jobs and the head of a successful, industry-disrupting startup with novel technology. The difference is that usually, when people say they're Jesus, everyone knows they're wrong, but SV really is full of successful startups. So everyone just believed her, at least until they finally realized there really wasn't anything there. I don't know Holmes and am not knowledgeable about the Jerusalem Syndrome, so I can't really say. If I had to guess, it was probably nothing exotic like that. The book suggests Holmes was too image conscious and craved the spotlight too much. She imitated Steve Jobs because he was popular. People often do that: copy popular people. A celebrity wears a new look, and consumers rush to duplicate the style. I remember the book mentions that Holmes was reading Job's biography when she began to imitate him. Theranos employees joked about how they could tell what page she was on by the change in her appearance.